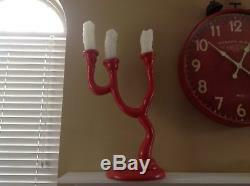 You are looking at a very rare Who Red Candelabra from the movie "How The Grinch Stole Christmas" staring Jim Carey. 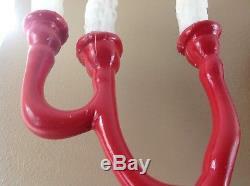 This movie original Candelabra can be seen in the big Christmas feast scene at the end of the movie. There were several of these on the table but only a few survived. The height of this Candelabra from the base to the top of the candles is just under 3 feet with the base being 12 wide. This is a rare item that you will probably never find again. Comes with a COA from Universal Pictures and Premiere Props. 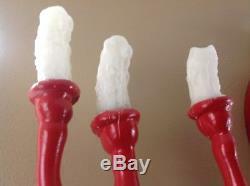 Heat up the bottoms off the candles and melt the wax and stick them back on. Thanks for looking and feel free to make an offer! 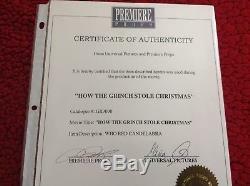 The item "Grinch movie prop How the Grinch Stole Christmas Who Red Candelabra" is in sale since Sunday, February 4, 2018. This item is in the category "Entertainment Memorabilia\Movie Memorabilia\Props\Originals". 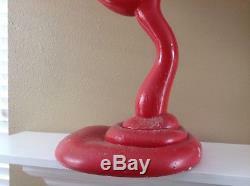 The seller is "basinbreeder88" and is located in Oak Harbor, Ohio. This item can be shipped to United States.